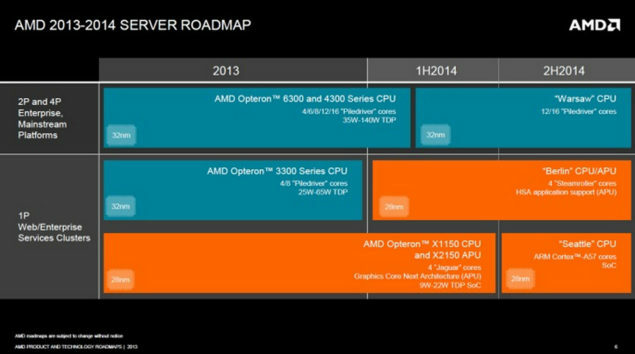 A few days ago, AMD made their server roadmap public which detailed their upcoming Opteron enterprise solutions for 2013-2014. The server roadmap consists of the high-end Warsaw CPU for 2P and 4P server configurations, HSA and x86 enabled Berlin APU and the first ARM based SOC solution for 1P enterprise configurations codenamed “Seattle”. We will detail Warsaw and Seattle in this post but first we want to talk about the Berlin APU. The Berlin APU for server and enterprise space is the same thing as the Kaveri APU for client market. The Berlin and Kaveri APUs both feature an industry’s first HSA enabled architecture which allows cross sharing of memory along the CPU / GPU for efficient work environment. Both APUs come with the latest 28nm Steamroller architecture that brings greater IPC improvement over Bulldozer and Piledriver architecture. They would also feature the latest next generation Radeon cores (GCN) which have already been featured on AMD’s discrete HD 7000 series lineup. The only known difference at the moment between the two platforms is that Berlin would support ECC memory while Kaveri APUs won’t. 4Gamer has some intresting information regarding the new Berlin APU which provides a glimpse at the Kaveri APU. 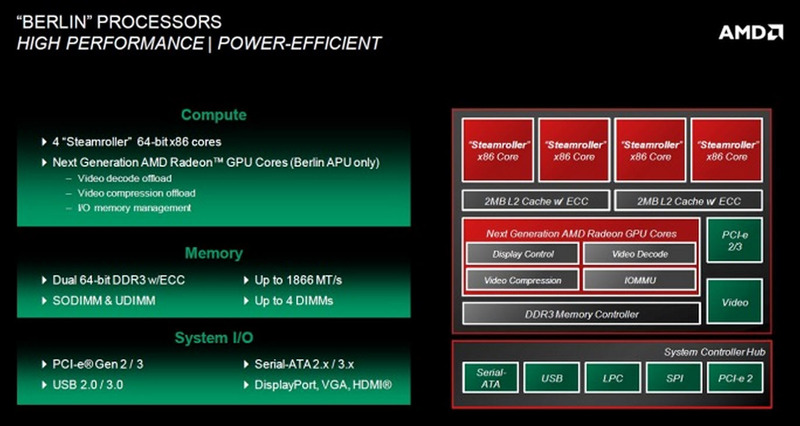 The site reports that AMD will not only use upto four x86 steamroller cores in the next generation Berlin APU but also feature 512 Next generation Radeon cores in the Berlin APU. You may remember when i talked about Kaveri APUs featuring upto 6-12 compute units for the integrated graphics which would put the performance equivalent to a Radeon HD 7750/7770 but clock speeds would be marginally lower. 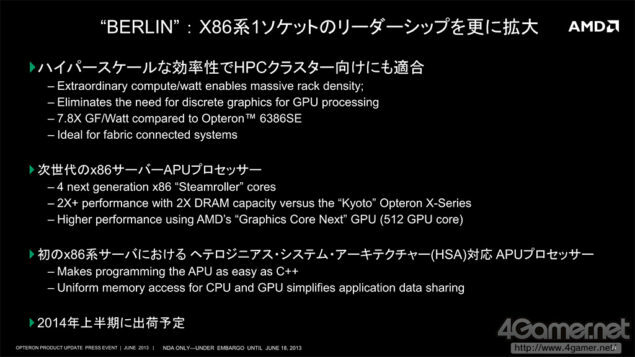 AMD mentioned that the Berlin APU with a 35W TDP and 512 SPs would deliver 700 GFLOPS of compute performance, a Radeon HD 7750 with 512 stream processors has 819 GFlops of compute performance but faster clock speeds than the Berlin APU. 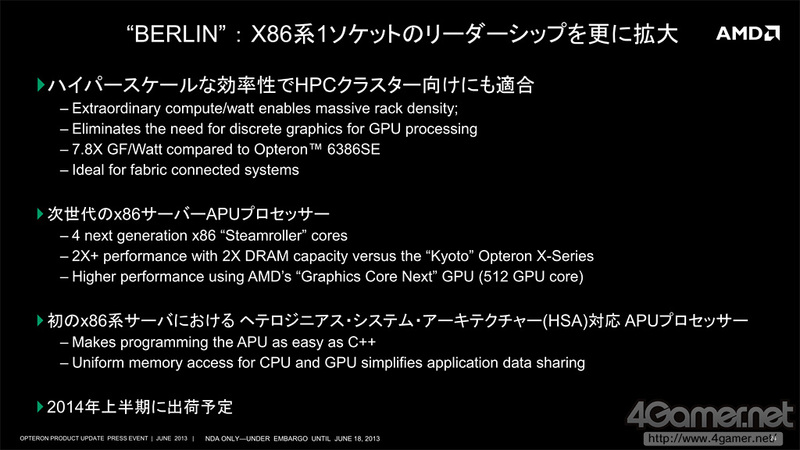 If AMD does put a similar chip inside the Kaveri APU with 512-768 SPs, then this could mean that the next generation APUs would deliver about the same performance as an entry level discrete GPU while the CPU side would remain strong and improved thanks to the Steamroller core architecture. AMD would launch their Kaveri APUs in both 65W and 100W variants for FM2+ desktop platform in Q4 2013 while 35/25/17W mobile variants would be made available later on. The Berlin APUs would launch later in 1H of 2014 followed by Warsaw in Q2 2014.